As I write this post, a record Powerball lottery drawing is getting ready to be held. The jackpot drawing is estimated to be $550 million. After paying taxes, the winner(s) will receive only an estimated $360.2 million. Thinking about being handed a huge amount of money, people begin to dream. I would never work again. Many people believe that things would be different “if they were rich”. I have found that money only magnifies who you really are. I have heard many people say that they would be very generous if they were rich, but they aren’t giving any money away in their current circumstances. Their lack of generosity would not change much even if they gained substantial money. On the other hand, if one currently lives a life of generosity, that person would also be very generous should they gain tremendous wealth. Want evidence? Just look at the lives of famous people – actors, athletes, and highly compensated business people. Money only AMPLIFIES who they were before they achieved wealth. If you want to be an awesomely great rich person, be a great person on your way to building your wealth! Lesson number 1; spend less than you make. Lesson number 2: Make sure you give and save every month. It’s very important to take advantage of compound interest over time, so START SAVING EARLY and avoid debt as much as possible, especially early in your career. This will save you a lot of grief and stress in later years, plus free up money to be able to be a generous giver. Debt means somebody else gets your money! 1. Income – Outgo = ZERO every month, every time. 2. 10% to God, 10% to savings at a minimum, every payday, every time. 3. Memorize these two website addresses and visit them often: www.joesangl.com and www.daveramsey.com End of lesson. Save most, and spend some. Save for a rainy day, as the old saying goes. You don’t own your money, you’re just a manager. Make it grow. Be ready to let it go. Give away more than you think you can. Always pay your tithing- the Lord will provide. Those are 10 of our favorite responses! Do any of these responses connect with you? 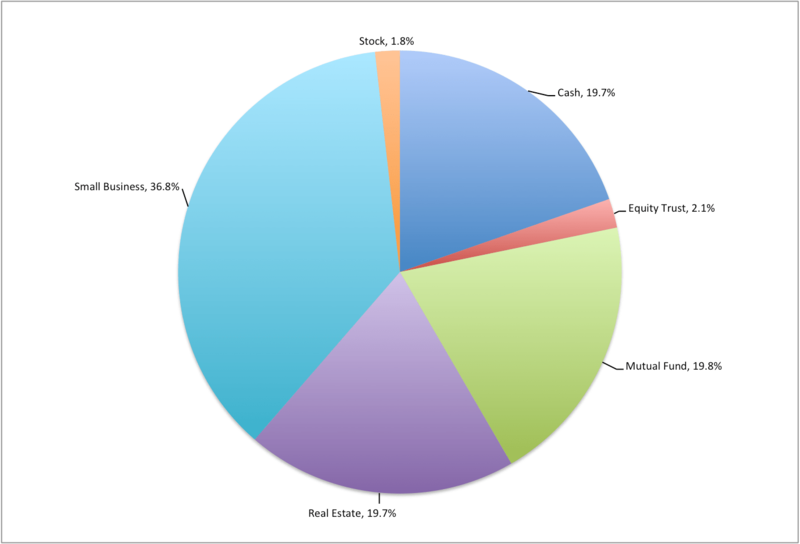 In my last update on March 30, 2011, I shared that I was focused on diversifying my investments beyond publicly-traded instruments (stocks, bonds, mutual funds, ETFs, etc.). The below chart shows continued progress as a result of that focus. Can’t see the chart? Click HERE. It is vitally important to maintain margin. Cash on hand is essential to the long-term success of any effort – personal, small business, or large business. As a result, you can see strong cash holdings. Some of these funds are not open to the general market, which is why they do not have a “Ticker Symbol”, but I am able to invest in them through my previous employer’s 401(k) plan. One reason I hold so many mutual funds is because of a variety of 401(k), 403(b), Roth IRA, and 529 holdings – each plan has different mutual fund selections available. I do not “eat, sleep, and breathe” the stock market on a daily basis. I update my net worth once per month, but rarely jump in and out of funds. Day trading is definitely not for me. Our small businesses are growing – and we are putting people to work! That FIRES ME UP! I would love to hear your thoughts on these investments! If you had just 10 minutes to teach your child about money, what would you teach? Share below! I will share some of our team’s favorites throughout the next few weeks! Can’t see the form? Click HERE to view it.